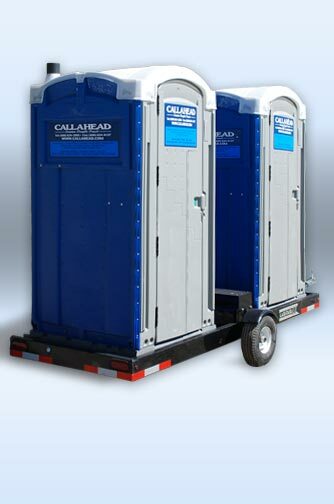 CALLAHEAD has the largest variety of full sized portable toilets to rent with the DOUBLEHEAD TRAILER porta potty transporter for short-term rentals. Special events will also benefit from renting the DOUBLEHEAD TRAILER. 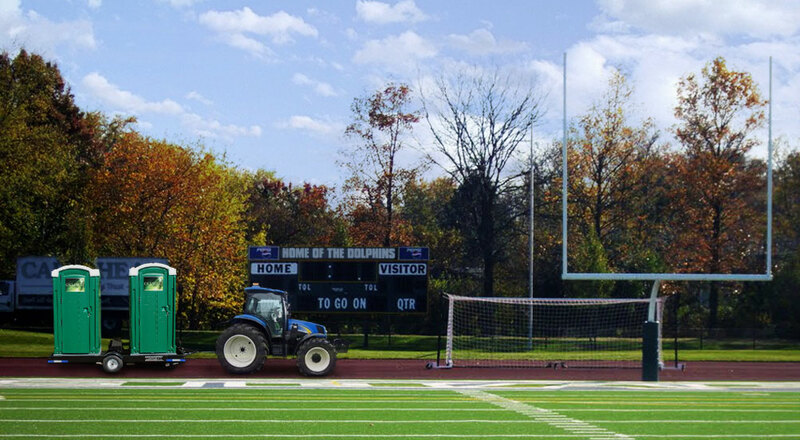 Perhaps the event is on a beach, park, lake, camp ground, golf course, beach club, marina, country club, or any location not accessible to large flatbed trucks, the DOUBLEHEAD TRAILER will simplify an oth- erwise difficult situation. Just attach on of our DOUBLEHEAD TRAILERS to a small pick-up truck or golf cart to move your special event portable restrooms to that hard to reach location quickly, easily and safety. 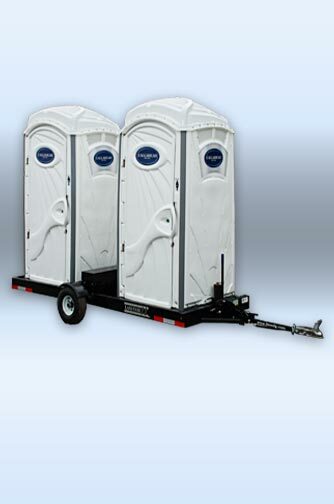 The DOUBLEHEAD TRAILER can be rented along with any two regular sized CALLHEAD portable toilets you choose. Because CALLAHEAD has the largest variety of porta potties in New York, you can’t lose. Even if you have a construction site on a bridge or inside a tunnel that doesn’t permit tank trucks for servicing. 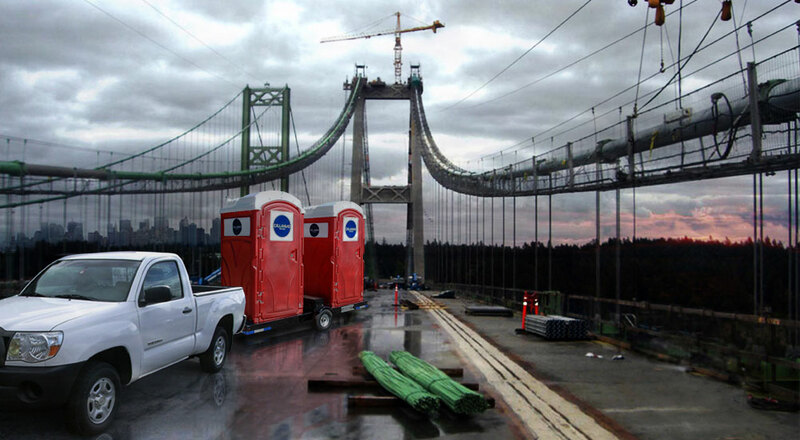 •The RED HEAD portable toilet is the most popular rental for tunnel, road, and bridge construction jobsites. Road and highway construction is often for miles, the DOUBLEHEAD TRAILER our RED HEAD portable toilet rental is an excellent combination. The bright red coloring of the RED HEAD will stand out and alert traffic to slow down for the safety of the construction site. Its Asian designed circular CALLAHEAD signage will also bring class to any construction site. •The GREEN HEAD is our full sized portable toilet recommended for home construction sites, residential areas, golf courses, campsites, park grounds or other agricultural locations due to its beautiful garden theme. The GREEN HEAD blends right in with any landscape to bring a classy look to your location. The DOUBLEHEAD TRAILER is an ideal combination to move your GREEN HEAD portable toilets to help preserve lawns, gardens, and other landscaped areas. •The BLUE WATER TOILET port a potty’s will fit right in by beaches, marinas, lakes or pool areas. Can you imagine the difficultly you’d have moving two portable toilets on the sand at the beach or the dock of a marina because trucks aren’t permitted or won’t fit. 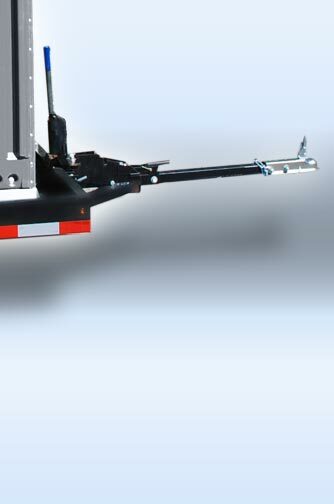 The DOUBLEHEAD TRAILER will smoothly carry your BLUE WATER TOILETS, to waterfront locations with minimal effort. •A WHITE TOILET is a popular portable toilet to rent for just about any long term porta potty need in New York. Because this toilet is white, there is no place for the dirt to hide. Which means, you will not only feel that the WHITE TOILET is clean, you will see it providing user confidence that the porta potty is clean. 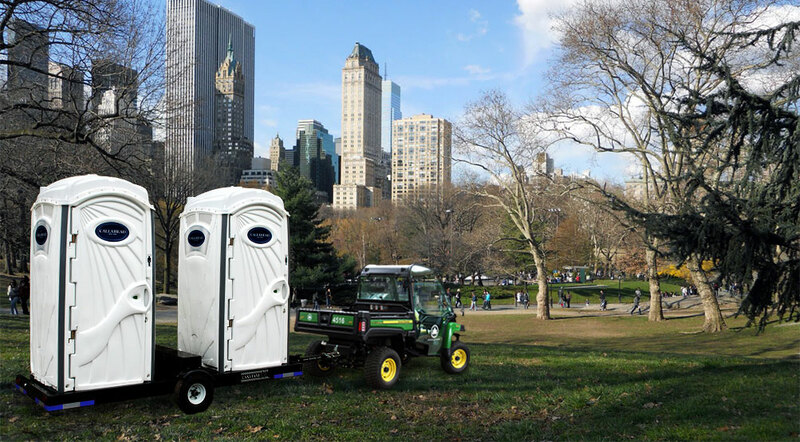 This is a favorite New York portable restroom rental that can be easily transported to those locations off the beaten path. •The CONSTRUCTION WASH & FLUSH provides toilet and hand washing capabilities in one portable toilet rental. Ideal for construction sites because of its orange and grey coloring to match the machinery and cement. 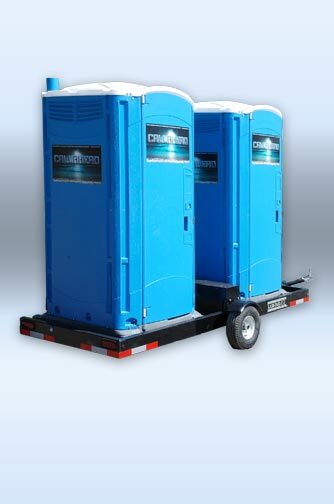 Example: The CONSTRUCTION WASH & FLUSH is a full sized, full service portable restroom rental. 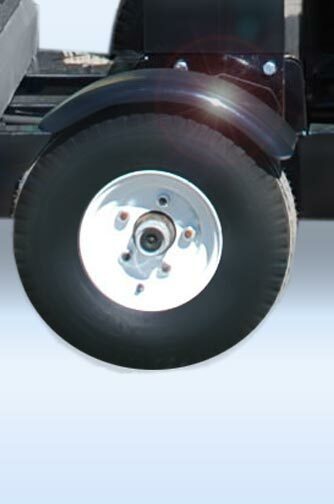 The DOUBLEHEAD TRAILER can carry two of the CONSTRUCTION WASH & FLUSH with ease. 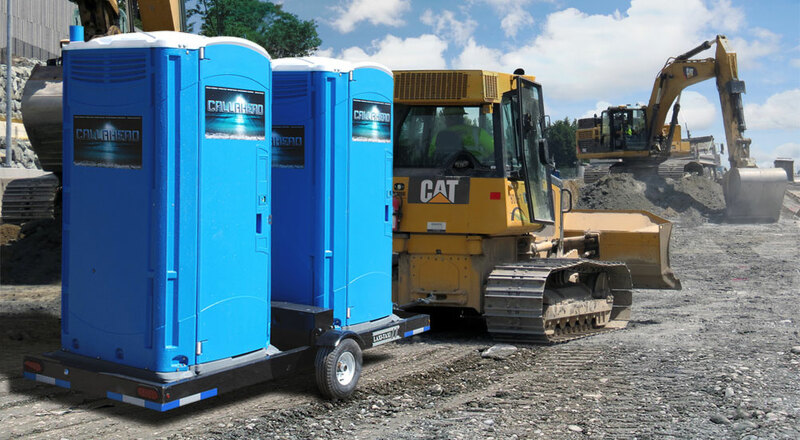 You need full sized portable toilets for the jobsite or special event, however, the location prevents access to flatbed trucks and tank trucks that are necessary to deliver and service porta potties. 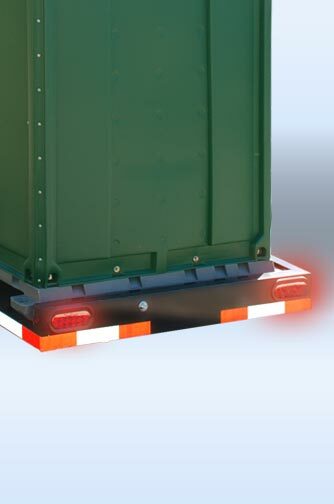 This obstacle can make moving portable toilets extremely difficult or even impossible. 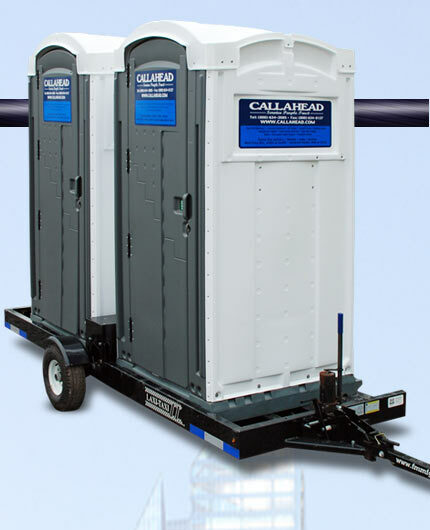 CALLAHEAD's DOUBLEHEAD BATHROOM TRAILERS solves this problem by quickly and effortlessly carrying two porta potties at once without any need of a flatbed truck. The DOUBLEHEAD TRAILER is a single trailer that was specifically developed and engineered to transport two standard sized porta potties simultaneously with minimal effort involved. This DOUBLEHEAD TRAILER can tow two full sized portable toilets by attaching to any smaller sized vehicle with a trailer hitch such as a garden tractor, golf cart, or other small vehicle. The DOUBLEHEAD TRAILER is perfect for large highway construction sites that require more than one portable toilet onsite because it allows two porta potties to follow the construction crew. With the DOUBLEHEAD TRAILER porta potty transporter it has never been easier to move two portable toilets at the same time. Even more conveniently, you don't ever take the portable toilets off of the DOUBLEHEAD TRAILER to use them. 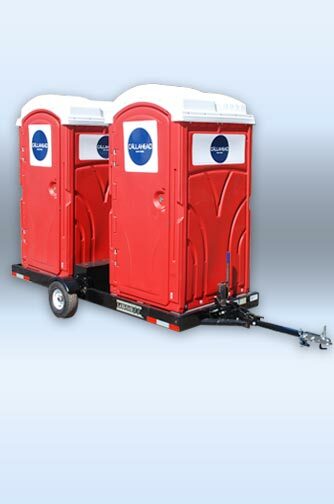 Once you move your two portable toilet rentals to the required location, the DOUBLEHEAD TRAILER easily lowers the two portable toilets to the ground level for stable and easy access. 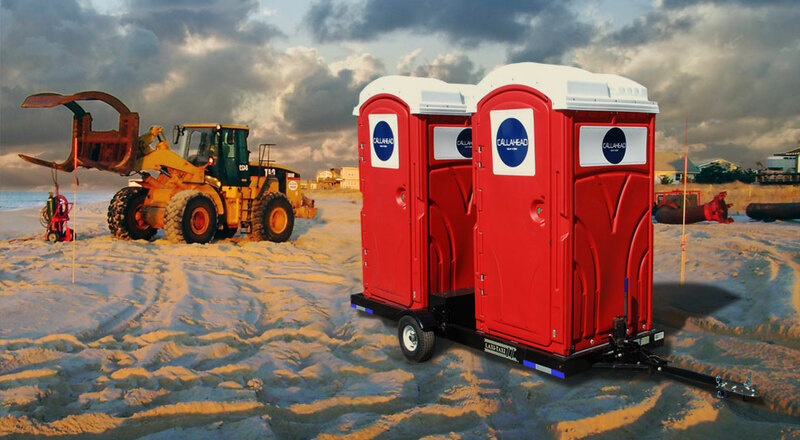 When you are ready to move the full sized portable toilets, easily crank the DOUBLEHEAD TRAILER to lift the port a potties to move your two portable toilets along with the construction crew to the next location. Another advantage, these portable toilets move just as easy when completely full. 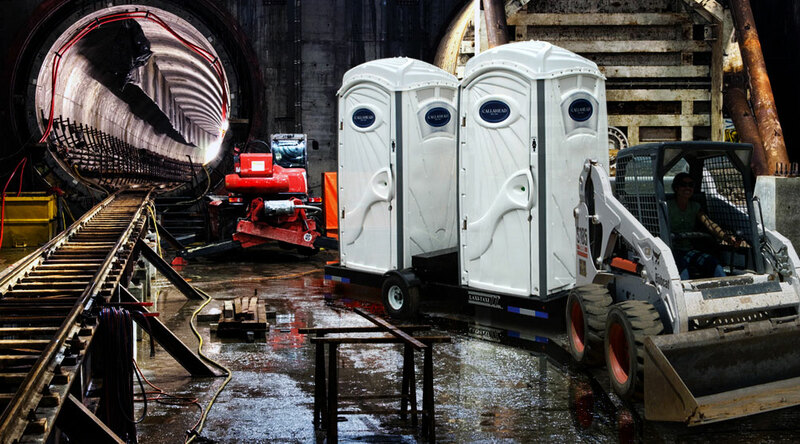 CALLAHEAD has been in business since 1977 delivering and servicing the best portable toilets to New Yorkers. We supply same day service throughout all of New York City's five boroughs of Manhattan, Brooklyn, Bronx, Staten Island, and Queens, Nassau and Suffolk Counties on Long Island, and all of Westchester County. We are experts in the in the field and can help you select the best portable toilets and portable restrooms to fit your budget and need. We are committed to the most advanced New York portable toilets, portable sinks, restroom trailers, guard sheds, holding tanks and porcelain toilet and sink systems, and other accessories available anywhere else. Don't settle for anything less than CALLAHEAD for all of your long-term and short-term New York port a potty rental needs.